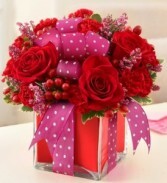 Resplendent in red, this truly original arrangement of ravishing blooms will beautifully express your feelings. Combining the timeless elegance of classic red roses, carnations and hypericum with the fashion-forward approach of a cube vase arrangement, it arrives all wrapped up with a flashy bow. Perfect for birthdays, anniversaries, or the one who makes you feel red, hot and fabulous. Other colors available. 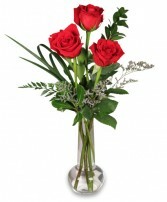 Simple but elegant, one, two or three roses in a clear glass bud vase. Greenery & filler may vary. Other rose colors available. 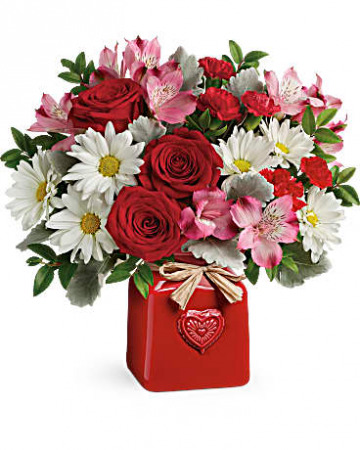 Add some romance to the occasion with this rich arrangement. 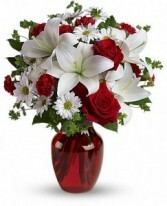 Red roses, white lilies and playful daisies are gathered in a ruby red vase!